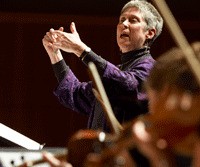 Virginia Hancock, Professor Emeritus of Music, directed the Reed Chorus and Collegium Musicum and taught first-year music theory and a variety of music history courses from 1990 until her retirement in 2016. She holds degrees in chemistry from Reed and Harvard University and a doctorate in music history from the University of Oregon. She is the author of Brahms's Choral Compositions and His Library of Early Music (Ann Arbor, 1983) and a number of articles on the subject of the composer's study and performance of Renaissance and Baroque music, his own choral music, and his songs.